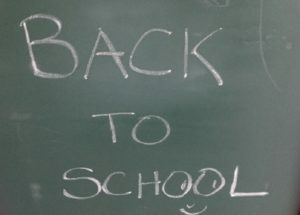 Starting school and Back to school time can be met with both excitement and nerves. If your little one has eczema, it’s the parents that can be more nervous than the child! But with some planning, preparation and communication, it can be a lot easier than you think! Here are some top tips. Some may apply more than others, depending on the age of your child. Triggers – Discuss what your child’s triggers are, how to best avoid them, how your child behaves when having an eczema flare and how to best handle it. Medication – Make an Eczema Relief Kit for your child to keep at school or to bring with them each day. Talk through the kit with your child’s teacher to make sure they understand what each item is for. Things to include can range from moisturiser, antihistamine, bandages, eczema clothing (such as the Itchy Little Monkeys Shruggi™). Heat – Request that the windows in the classroom are kept open to allow fresh air to circulate and that your child is seated away from heat sources. Uniform – Many school uniforms unfortunately can be very heavy and made from synthetic fabrics. Where possible, your child should be dressed in 100% cotton clothing to prevent itching. Discuss the necessity of having your child wear natural fabrics as part of their uniform – there are usually similar cotton alternatives available. Moisturiser – Your child should carry a tub of moisturiser with them to school . Depending on the age of your child, they may be able to apply themselves or the teacher can assist them. Make sure that you have applied moisturiser to their skin before sending them off to school each morning. Education – Educate your child about eczema, their triggers and how to best manage the symptoms. This will help them prevent and treat their symptoms when they are not with you. Validate feelings and insecurities they may have about coping with eczema, especially social insecurities. Children with eczema can feel isolated in social settings. Stress – Stress is a trigger for eczema whether it stems from the symptoms and treatment of eczema or the academic and social pressures brought on by the school year. It is important to find ways to help your child prevent and cope with the stress brought on by school. Make sure your child takes part in activities they enjoy and talk to your child about their feelings regularly.